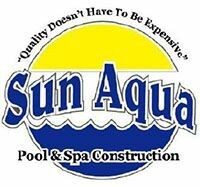 WELCOME TO... SUN-AQUA POOL & SPA CONSTRUCTION! Building quality custom gunite pools and spas in Southern California for over two decades. Family owned and operated, owner supervision throughout construction. The owner has been in the pool and spa industry since 1974, over 43 years of hands on experience in all phases of pool and spa construction.